Hey you awesome hooligans! Tiff and I were out of town for two weeks house-hunting in Ohio! That's why I didn't update last week, because I didn't take my notebook with me, just to be sure it didn't get damaged. The good news is we found some great houses! Our first pick is a 1968 4/3, split-level house in Dayton with everything everyone in our 7-person blended family ever wanted! Plus a giant 2-car garage and a huge finished basement. The house needs some work -- a couple of doors and the pool in the back is busted... but it was just at the top of our $60k limit and it's perfect! 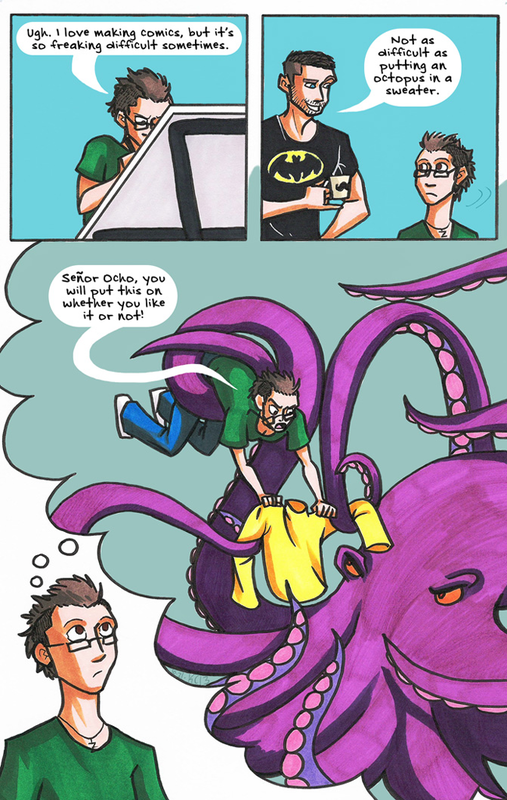 This week's guest comic is from Kelci D Crawford of Johnson and Sir. Go check her out! Now I'll be getting back to formatting those ebooks from the Kickstarter before we have to move in December! Are you a hooligan? Do you have an idea for a comic? Email your guest comic to sam at comiccomet dot com and I may put it up here! Thanks, hooligans! And stay awesome! Good to hear the trip went well.